It’s that time of the year again, where we in the West indulge our passion for all things festival. Music, arts, culture, you name it and we’ll hold a people’s gathering to celebrate it. The problem is, some of these events can be huge, which means not just crowds of bodies clamouring for the best view of the action, but during weekend events acres of tents and assorted living places jostling for position in anonymous chaos. So how can you ensure you find your own tent once you’ve left the merriment and staggered back to where you thought it was? This TentFinder gadget is definitely one very cool solution. The unit contains 23 bright LEDs in an array, which are controlled with a wireless remote control. Leave the light in the tent, and when you return in the dark activate the remote and the lamp will light up like a beacon to guide you home to that snuggly sleeping bag. You’ll need to be within 50 metres of your tent though, so it might be problematical if you can’t even remember the field you’re in. Priced at $29.95 or £19.99. 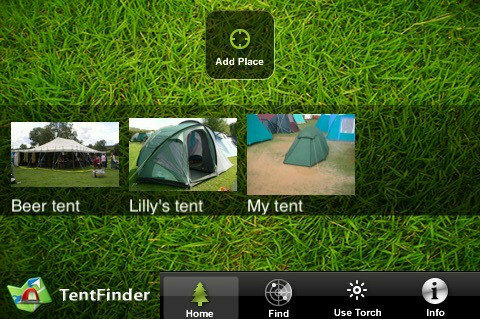 Lucky iPhone owners have an alternative option with the TentFinder App, which makes use of GPS positioning to mark your tent position, no matter which field it’s in. Log your location (with a photo if you want) at various points in the festival area (useful for toilets, food trucks and even the main stage perhaps? ), give it a name and you’ll be able to return to it later when you’re possibly in worse shape and need a helping hand. It’ll cost you $0.99/£0.69 for the app though, so not everything in life’s one big free party, OK? Now get off our lawn.